Check out this custom Aztec Tattoo by San Diego Tattoo Artists Terry Ribera at Remington Tattoo in Northpark San Diego, CA. 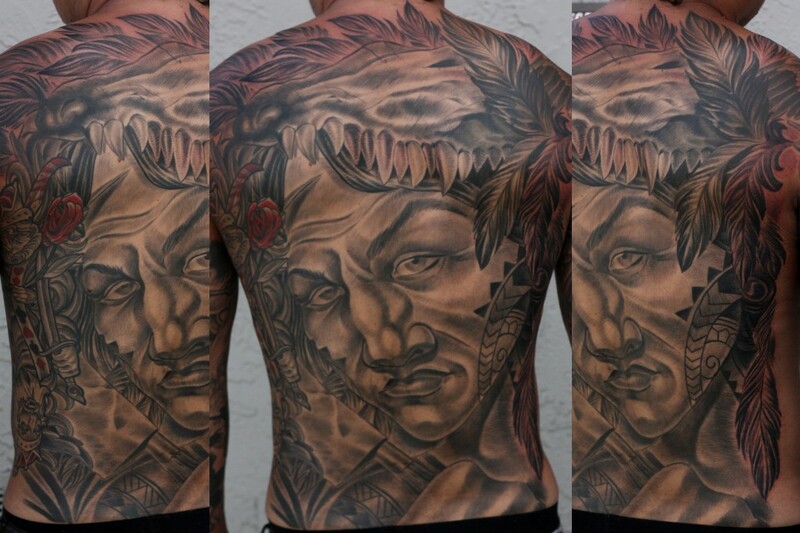 Terry Ribera is the lead Tattoo Artist in the San Diego Tattoo Shop Remington Tattoo. Terry is booking appointments now. 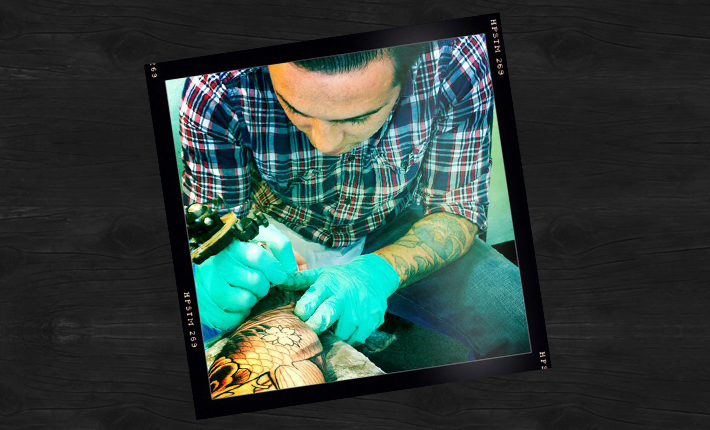 See Remington Tattoo’s website for more information about Terry Ribera and the wonderful staff at Remington Tattoo Parlor. Brand new snake tattoo! 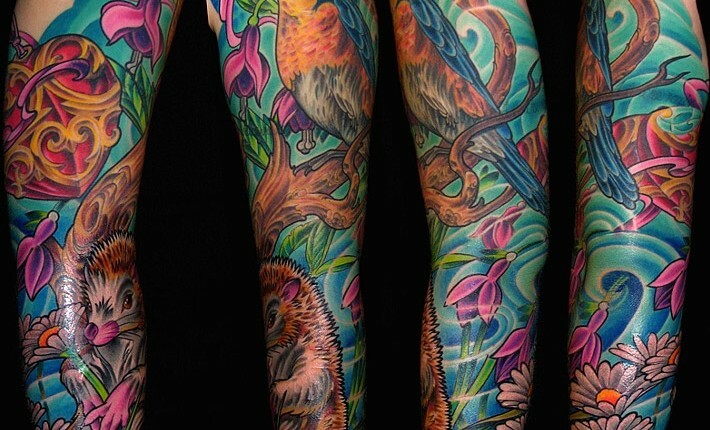 This is going to be a really beautiful forearm piece. In fact, one of my last posts before our vacation to Costa Rica, which is famous for its biodiversity: over 130 different snake species make Costa Rica their home, and this includes some of the world’s most deadly. Bushmasters, coral snakes, and the REALLY dangerous fer-de-lance are famous. If you didn’t have a chance to Visit San Diego’s best little tattoo parlor Remington Tattoo on the 8th you sadly missed out. There where new paintings to be seen at the show plus prints. 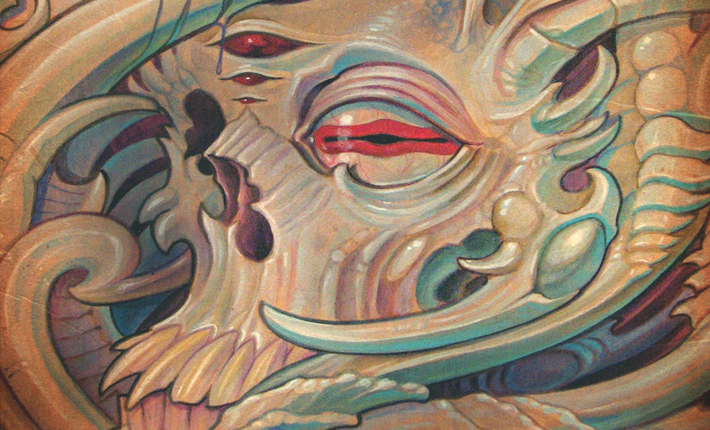 Today in this blog posting we will be sharing with you a glimpse of some of the new art on display. 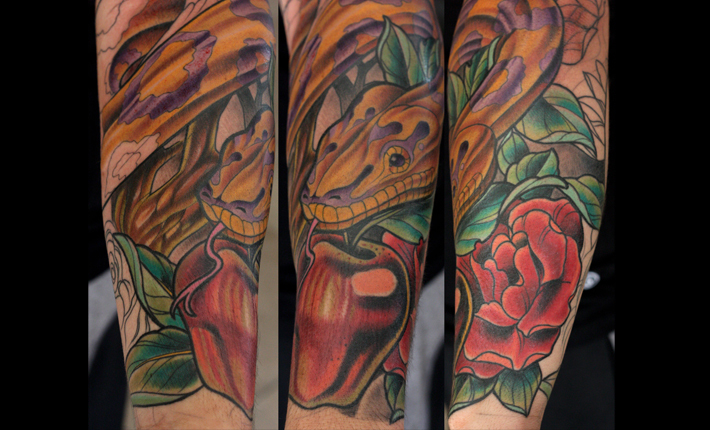 Terry Painted this classic Japanese tattoo concept of a Hanya and a snake with peony flowers. The technique involved to make the painting is a russian dry brush technique using oil paints and sewing machine oil on cold press water color paper. 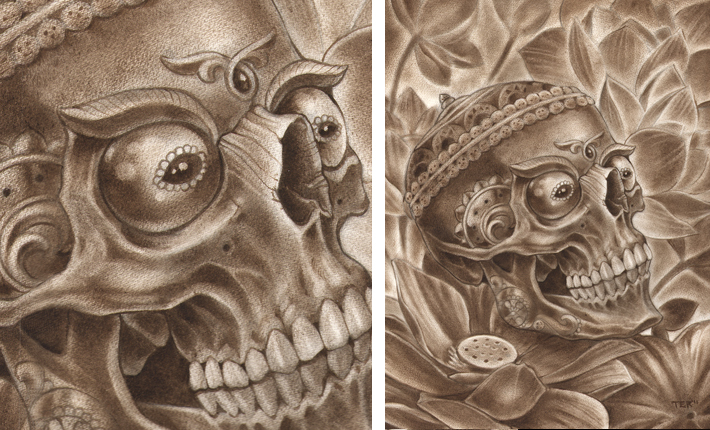 The Results mimic charcoal drawing, but the art is made with traditional oil paints. A small amount of paint is added to bristle brushes and lightly wiped off onto a rag and then applied in a scrubbing technique. The paper is treated with sewing machine oil to help with the blending and lifting of the paint. Details are added in with a kneaded eraser and eraser style pencil. darker areas, and crisp edges are placed in with softer camel hair brushes mixing the paint with the sewing machine oil for those darker areas only. This tattoo has been a huge honor for Terry to tattoo his long time Friend Dan Pryor a local San Diego tattoo artist at Seven Seas tattoo. 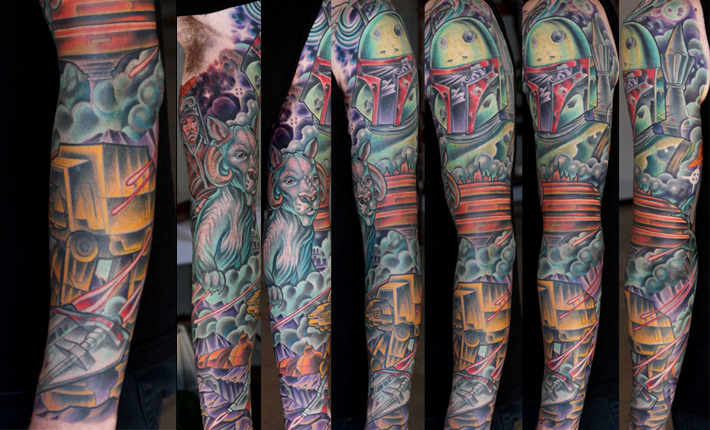 Terry Ribera originally started the tattoo while working at Avalon Tattoo II, but has since completed nearly half the work while at his new shop in North Park. Dan and Terry have known each other for nearly 7 years and worked together at Seven Seas at one point. 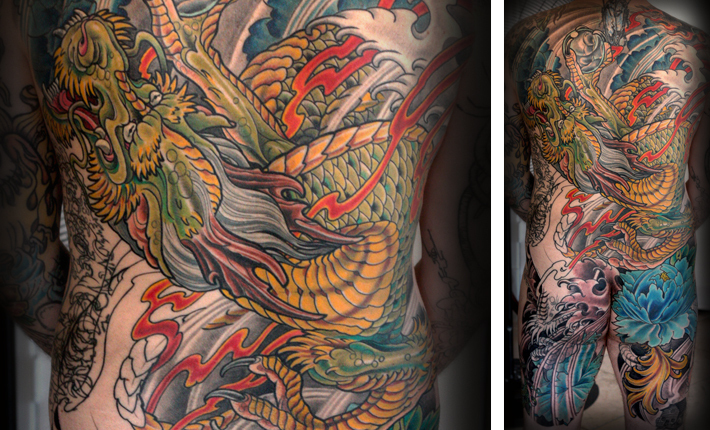 Dan had explained to Terry Nearly a year ago that he wanted his back to be tattooed in a large Japanese theme of a dragon, water, flowers and some fire. 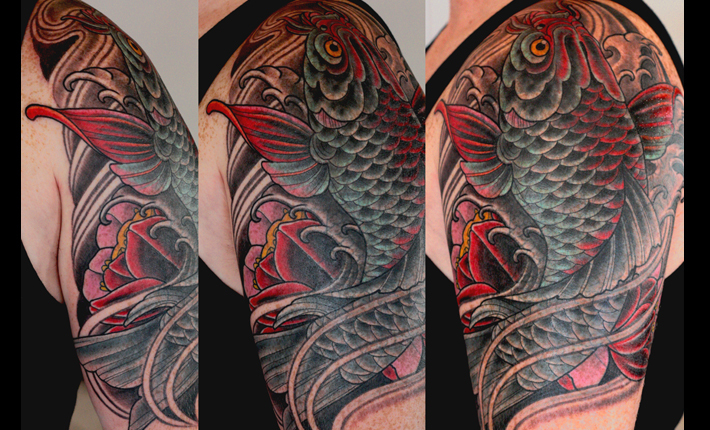 Terry was eager to take on the project as it’s challenge he has not had the chance to tackle and the fact that it was on a fellow tattooer made this project even more exciting. There was some cover up issues with design and some older tattoos to work around, but so far the tattoo is shaping up well. We will have to thank Dan for Sitting like a rock and pushing through a lot of sensitive areas while getting his tattoo worked on. After many of the sessions Dan had to return to work the next day and we are sure that in itself was no easy task. 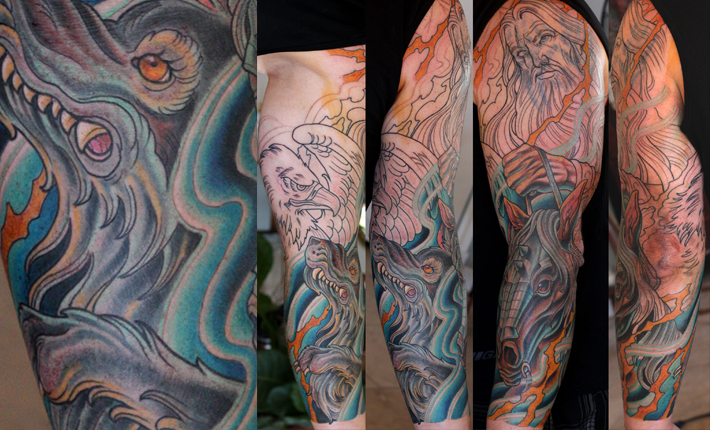 Ian flew down from Canada to San Diego to get tattooed by Terry Ribera at Remington tattoo last week. 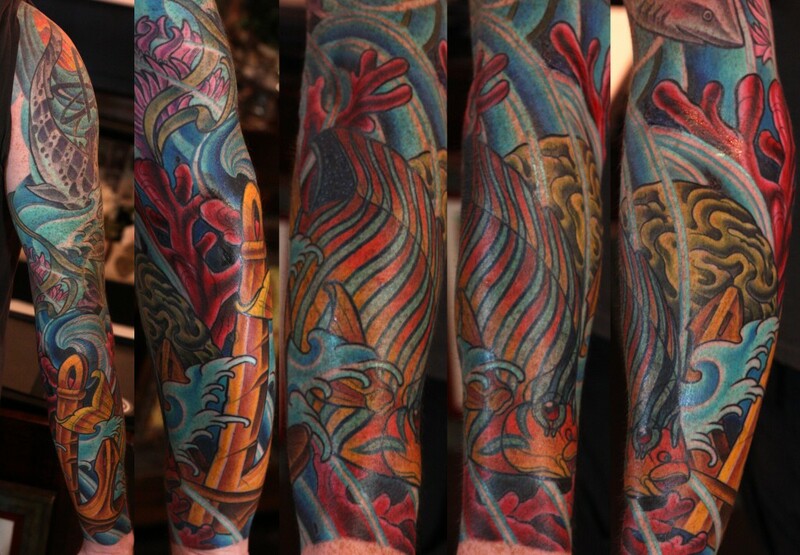 He sat for 2 days in a row to have his sleeve outlined and colored and this is the result of two hard days of work. 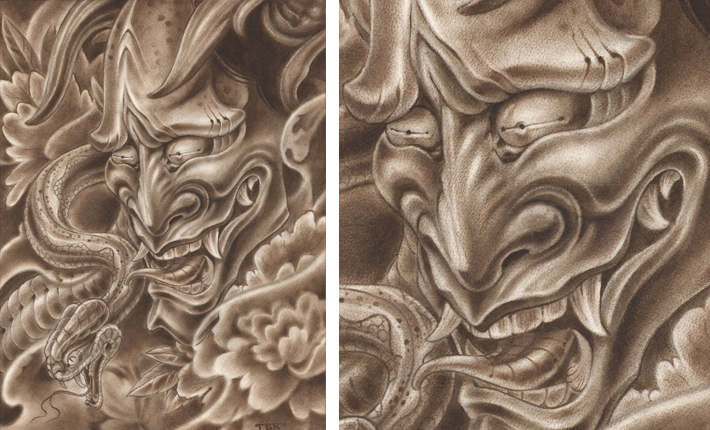 Terry Ribera and Ian will be finishing up the tattoo at this years 2011 Body Art Expo, where they plan to do another 2 days of tattoo to finish the tattoo. Each sitting lasted around 4.5 hours and the follow up sittings in november should be close to the same. 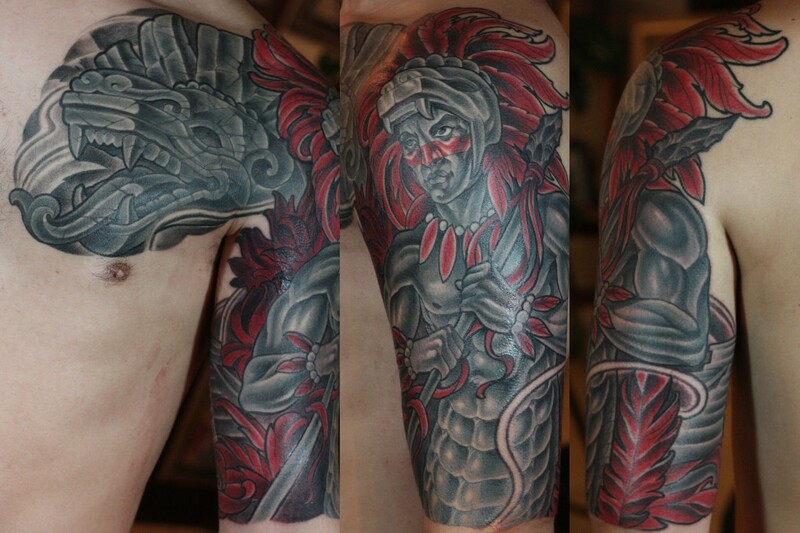 It’s always an honor for Terry to tattoo a client that is willing to travel such a great distance to get tattooed.